Arctic terns are protected by the Migratory Bird Treaty Act. Possession and take (which includes harming, harassing, injuring and killing) is illegal. Distribution: Since 2002, between 3 and 14 pairs have nested each year at the Isles of Shoals. Description: 14-17” in length. Similar to common tern with black cap on head, light gray back, deeply forked tail and pointed wings. Light gray coloring underneath and solid red bill distinguish it from other tern species. Commonly Confused Species: Common tern, roseate tern and least tern. Habitat: Arctic terns inhabit rocky coastal islands, coastal beaches, and marshes with ample supplies of fish and crustaceans. 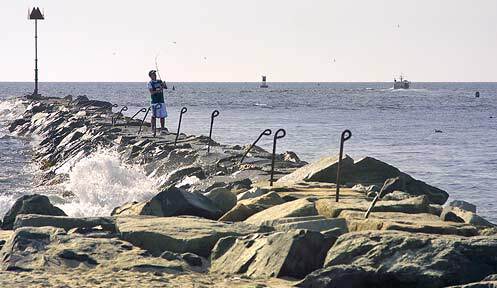 They breed in rocky, gravelly islands, barrier beaches, gravel bars, and occasionally in marshes and bogs. When nesting among other tern species, arctic terns nest on open ground with little or no vegetation and when nesting with members of the same species, arctic terns nest in low vegetation. In winter, arctic terns inhabit pack ice in open water and near-shore icebergs in the Antarctic Region. Life History: Arctic terns arrive in NH during April and May each year to breed. 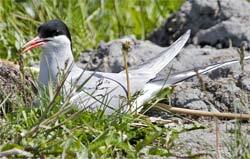 Each nesting pair of arctic terns lays 1 or 2 eggs during late May through July. After approximately 21-27 days the young hatch and approximately 28 days after hatching the young chicks are able to fly. The tern colony on Seavey Island at the Isles of Shoals consists of a combination of primarily common terns and also some roseate and arctic terns as well. Arctic terns leave NH during August when they migrate to their wintering grounds.